Looking To Build a New Home in Stevens Point Wisconsin? Have you just purchased a lot or small acreage and have decided to build a nice home for you and your family in the Stevens Point area? Maybe you’re planning on building that second cottage and you are trying to find a builder to work with over a long distance? If you’re looking to build a new “stick-built” (wood framed) home from the ground up you want to be sure you’re choosing a builder with the experience and crew to complete a task as large and important as a home for your family. Abel Complete Construction is a general construction contractor serving the Stevens Point area. We work with homeowners to construct new, stick-built (wood framed) homes on lots and acreages throughout Stevens Point. From a simple 1200 square foot cottage to a much larger two story 3500 square foot or more dream home our team will work closely with yourself and your architect (or your house plans) to construct the well-built home your family deserves. 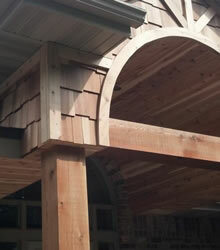 We specialize in timber frame construction and craftsman style homes, cottages, shops, garages and more. What Type Of Home Are You Looking To Build? Do you have a rough idea of the type of home you’d like to build on your property? Will this be an elaborate timber frame structure or are you looking to build a simple retirement cottage? How many rooms? how big will they be? Do you have a budget that you need to work within? or how about a specific timeline you need to have your home finished by? These are just some basic pieces of information to get the ball rolling when you’ve finally chosen a contractor to work with. Do you want a bright, open kitchen? A large garage or shop to store your toys and tinker around in? Maybe you’d like to have that luxurious spa-like bathroom? The list goes on and on as far as choices go when you’re building your own home. The limiting factor is always going to be your budget! What Type Of Lot Do You Plan To Build On? If your lot is serviced it usually means that connections to power, water, sewer and sometimes natural gas are already in place and ready to be hooked up to your new home during the construction process. If your lot is un-serviced (usually in more rural areas) it means you’re going to have to pay to have these services installed which could mean well drilling and the installation of a septic system and even running power poles (or underground lines) to your home. Is your lot you plan to build on level? or does the builder need to work with an existing slope on the property? Extensive excavation work can be extremely expensive and unless done right, building on a slope can lead to future problems. If you haven’t chosen a lot yet you’d find great benefit in engaging with a builder early on in this process as they’ll be able to offer assistance and a more thorough assessment of a property and how feasible your plans would be. Choosing the right lot could potentially save tens of thousands of dollars off the cost of building your new home. Have You Considered Accessible Home Design? For many people looking to build a new home they often plan to live there for many years. Accessible design is the perfect match for a family who’d like to age gracefully in their home or just make it friendly and accessible for everyone who may enter. Another important point to consider is the resale value and an accessible design will be attractive to any home buyer. Accessible design is the implementation of design features within your home that are accessible by all regardless of your age or physical ability. Large open spaces, wider hallways (and doorways if necessary), more accessible and innovative kitchen organization, less stairs and low maintenance are all some of the features of an accessible design. Why Choose Abel Complete To Build Your Home in Stevens Point? When you choose Abel Complete Construction to build your new home you are partnering with a small, locally owned company who specializes in construction. Rather than rely on sub-contractors for everything we build your home from the ground up and do most of the exterior work ourselves too. For your safety and to abide by local building codes we have professional electricians and plumbers hook up the various systems that make your home run comfortably and smoothly. 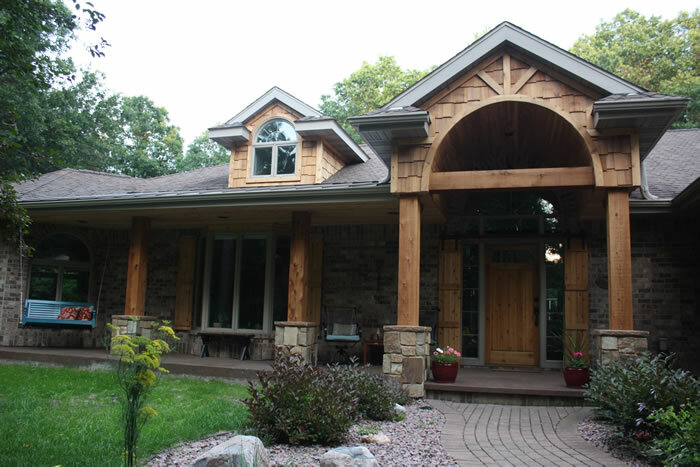 If you’d like to inquire about having a custom home built on your Stevens Point property please give us a call or send us an email and we’ll get right back to you so we can arrange a time to view your property and consult with you about your project.